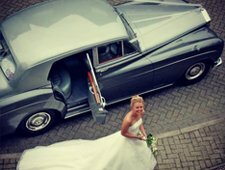 Wedding Dress specialists Molly Browns of York give their advice to ensure buying your dream wedding dress is nearly as special as your big day. The first thing to think about is what type of Wedding Dress is for you! Different designers from all over the world each have their own unique areas of expertise and style. Renowned designers such as Allure Bridals, Ellis Bridals and Ronald Joyce have a rich history of breath-taking styles to choose from but no matter what designer you have your eye on, be sure to do your research. 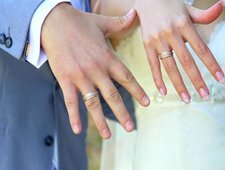 What have other brides had to say about them? Once you’ve found a designer that appeals to you, check out similar designers and pick a handful to focus on. Many Wedding Dress designer websites will link you directly to their trusted stockists so you can be sure to find the nearest boutique to you and book your appointment to try on! If your nearest boutique doesn’t have quite what you’re looking for, it’s ALWAYS worth travelling that bit further afield. WHO WILL HELP YOU CHOOSE? So you’ve booked your appointment, but you may not want to go alone. The question is, who do you take with you? Your best friend or Mum are always a good choice, they know you better than anyone, but remember, you know them too. Do their tastes conflict with yours? Be sure that the company you take will give you an honest opinion that you absolutely trust! Keeping your appointment intimate, with around a maximum of two guests is our recommendation. Too many conflicting opinions can affect your decision. Remember, it’s YOUR choice! The most important thing when trying on a Wedding Dress is to enjoy yourself! There is no need to be nervous. Any reputable boutique owner will tell you that the key is to relax and not let yourself get overwhelmed. Having your friends alongside you will also help to make the experience as enjoyable as it should be! It’s also a good idea not to overdo it with too many boutiques. 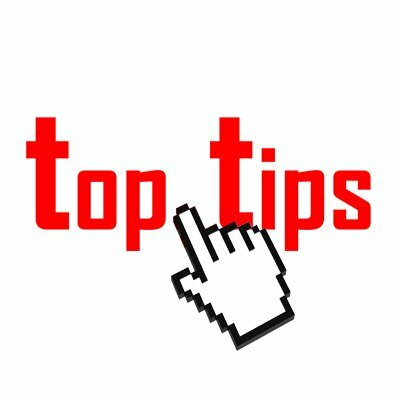 When doing your research, pick two or three to start with and see what’s on offer. Try on a handful of Wedding Dresses during your visit, pace yourself to gain a better idea of what you’re looking for. 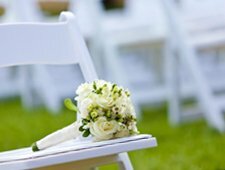 You may have been planning your dream wedding since you were a little girl and have the perfect dress all picked out in your head. It’s important though to keep an open-mind when choosing ‘The Dress”. You may find that that strapless fishtail dress you’ve always wanted just isn’t what you expected when you put it on. Consider different shapes and styles and listen to the advice of the boutique staff as well as your guests. You may just discover something stunning that you never would have thought to try! The Wedding Dress isn’t the only thing you’ll be wearing on the Big Day so it’s also important to accessorise properly! While some boutiques will offer a selection of Wedding Shoes, Veils and Jewellery, many do not. Remember that your Wedding Dress Accessories can make or break your whole look so it’s good to have at least a rough idea of how you plan to complete your dress. Naturally, most brides should base their shoes and jewellery choices around their chosen dress, but if you’re planning to wear some shoes with sentimental value, then be sure to take them with you! The simplest tip we can possibly give you is perhaps the most obvious. Trust your heart. You will know when you’ve found “The Dress”! If you’re unsure, once you get that feeling that you might have found the one… just try on a couple more. You’ll be able to tell by just how much you want to be back in THAT dress that your search is over. 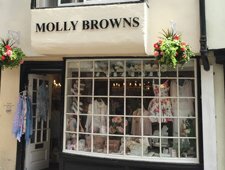 In 2008 Molly Browns opened their first shop in York, by 2015 they had two more. 21a Stonegate is a large and impressive building full of character with old beam features, higgledy-piggledy rooms, a mezzanine balcony, big chandeliers and ornate mirrors. 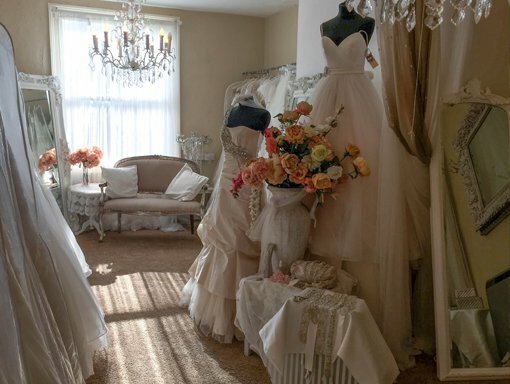 The collection of wedding dresses is housed in its own private room. Molly Browns is a family-run business with a focus on exceptional customer & after sales service both in-store and online. They cater to women throughout the UK and offer international delivery. The first thing to think about is what type of Wedding Dress is for you? 2 WHO WILL HELP YOU CHOOSE? Your best friend or Mum are always a good choice. The most important thing when trying on a Wedding Dress is to enjoy yourself. It’s important though to keep an open-mind when choosing ‘The Dress”. The Wedding Dress isn’t the only thing you’ll be wearing on the Big Day. The simplest tip we can possibly give you is perhaps the most obvious. Trust your heart.